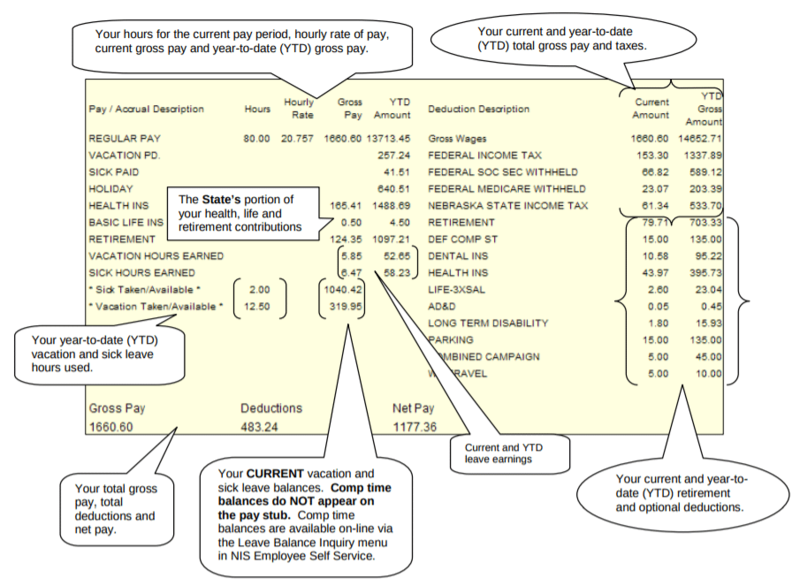 A pay stub is a document that serves as a record of an employee’s paid wages showing pre- or post-tax deductions taken. We provide over 50 free pay stub options to help you comply with state laws in the over half of U.S. states that require employers to provide pay stubs — even if you pay employees with cash or direct deposit. 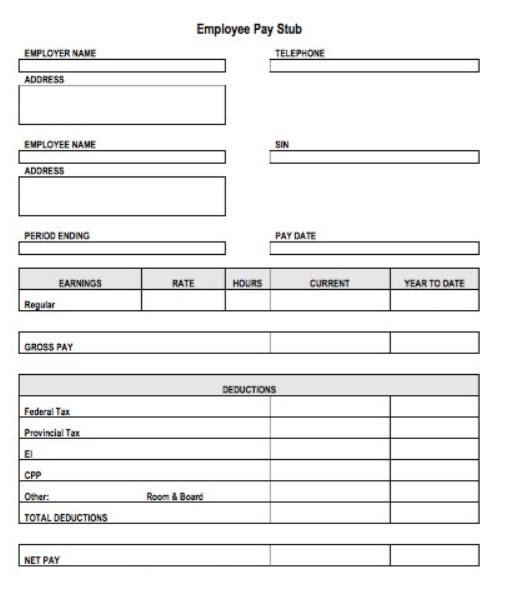 Here is a simple downloadable pay stub template that you can open, input your data into, save and/or print. It contains all the basic data fields you may want to use to document earnings and deductions. Any words or rows you don’t use can be left blank, customized or deleted from the template to make this work for your business. To avoid creating manual pay stubs, consider using a payroll service like ADP. In addition to offering your employees pay stubs, you can also let them manage their account information online or via a mobile app, and print their own payroll reports. Click here for a free quote. What to include on a pay stub is typically dictated by state law. For example, some states like Arkansas and South Dakota don’t require employers to provide pay stubs to employees at all. But providing a pay stub is much like providing a customer with a payment receipt. It proves, in case you’re audited or have an employee dispute, that payment was made. 26 states require employers to provide pay stubs. Only 11 states require the pay stub to be printed out or provided on paper. Nine states have no requirement for businesses to provide pay stubs at all. The remainder of the states let employers and their employees decide together whether pay stubs are provided — employees can opt in or out of receiving them. For example in California, details like hours worked, pay period start and end dates, and any piece work (number of units and rate) must be included on the employee’s paper pay stub. In Nebraska, you’re required to include used and available paid time off or sick leave information. But in Florida, unless your workers are in a union, you’re not required to provide a pay stub at all. Be sure to confirm your specific state’s requirements for what to include on your employees’ pay stubs. ADP is a payroll provider that can help ensure your pay stubs are calculated correctly and contain the required information for your location. Click here to get a free quote. Many pay stub templates include useful information such as the number of hours worked during the pay period, year-to-date balances, and paid time off taken. They may also include specific descriptions on the purpose of pre- and post-tax payroll deductions, such as for medical insurance, life insurance, commuter benefits, or uniform fees. 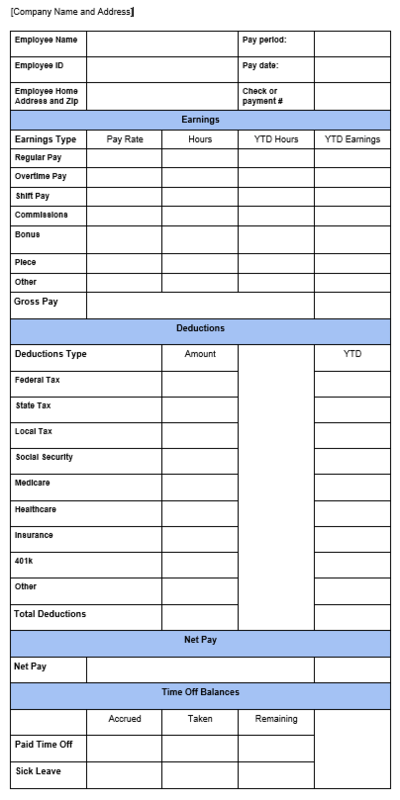 Using a pay stub template is an easy fill-in-the blanks way to ensure you’re correctly documenting your employees’ gross earnings, deductions, and their net pay. 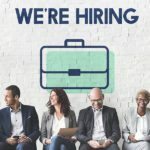 If you’re looking for a wider variety of options to fit your needs, these websites offer over 50 different free pay stub templates that you can use. In addition to pay stub templates, there are web-based pay stub generators that allow you to input your pay stub data manually. Some, like FormSwift, offer a free trial and others, like ThePayStubs, allow you to choose your own professional looking templates that cost a few dollars to use. Pay Stub Generator — This free tool on Shopify allows you to input your payroll data manually, and it generates a pay stub for you. It then requests your email address and sends the completed pay stub to you to download or print. ThePayStubs — This site provides 10 pay stub templates and provides a tool to let you fill the blanks in online. You have to pay about $9 for each pay stub you create. In addition to pay stubs, you can build and print W-2s and 1099-MISC documents as well. FormSwift — This free tool allows you to input payroll data and generates a pay stub for you in DOC or PDF format. You can sign up for a subscription that starts at $7.95 per month and they offer a free seven-day trial. The DOL has no mandatory retention requirements for any specific document like a pay stub, but it does require that payroll information be retained for three years. The IRS requires tax documentation to be retained for four years. And, some states, like California require payroll documentation to be retained for six years. Read our article that covers federal and state payroll document retention requirements to learn more about how long you need to keep payroll and tax documents in your state. When your business first starts out, you may be paying workers out of your checkbook or handing them cash. If you’re not using a payroll service, it’s important to keep some kind of record of that payment and any taxes and deductions, like a pay stub. 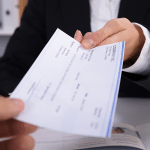 In addition, pay stubs help you meet the DOL requirement to retain payroll documentation, even if pay stubs themselves aren’t required to be given to employees in all U.S. states. If your state requires pay stubs to be provided to employees, consider using a payroll service. 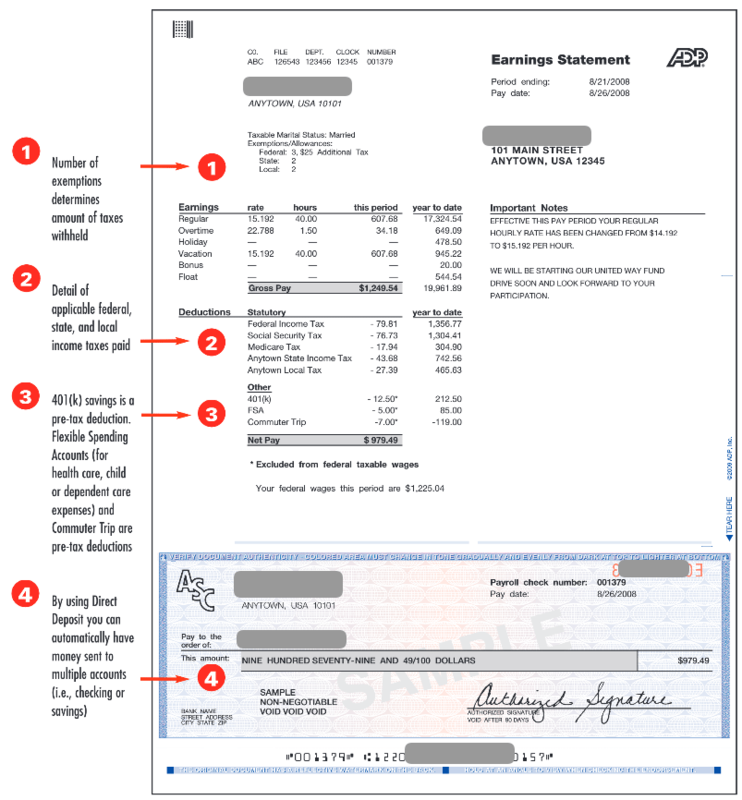 ADP is a small business payroll software that calculates and files payroll taxes, pays employees through direct deposit or printed checks, and lets employees print their own payroll reports and pay stubs. Trusted by over 500,000 small businesses! 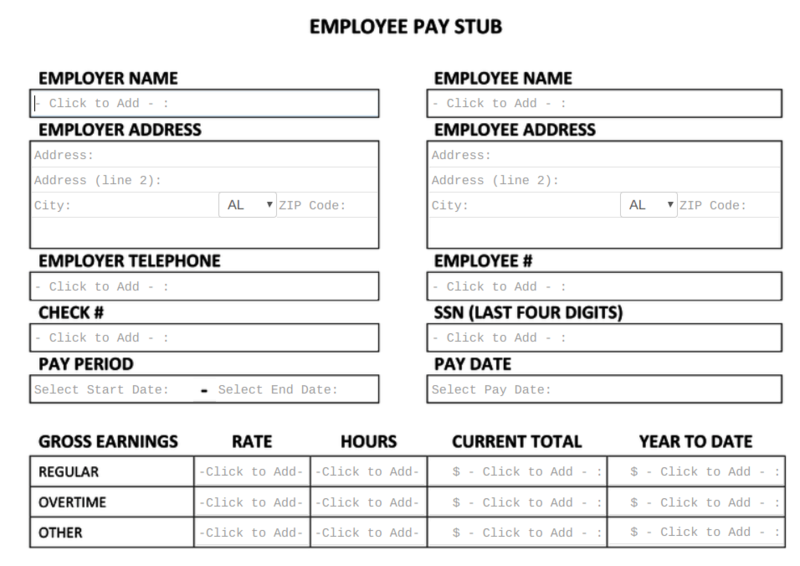 Here is a simple downloadable pay stub template that you can open, input your data into, save and/or print.